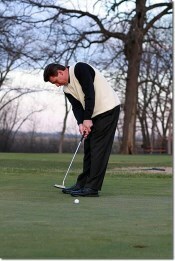 Personal instruction on putting covers the way you THINK and the way you PERFORM the putting stroke. The Ultimate Putting clinic is held at Ben Mutz’s Chicago area golf instruction facility. The Ultimate Putting clinic will help anyone who wants to learn how to putt better. If you are searching for golf instruction that will permanently help you lower your golf score and “teach you how to teach yourself” then The Mutz Method of Golf Instruction is for you. You will gain all of the knowledge you have been searching for and be on the path of building a solid foundation that will last a lifetime. If at the end of the clinic you are not satisfied with the results you get 100% of your money back!